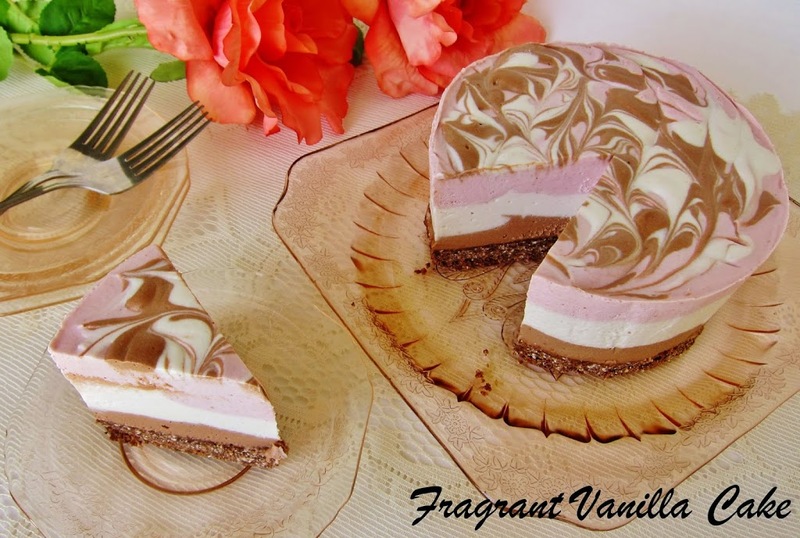 Raw Neapolitan Cheesecake, Blogaversary and a Giveaway! 4 years ago today I posted my first recipe on this blog. It was a red velvet cupcake recipe featuring beets, and it was not plant based at all because I had used cream cheese frosting and I had taken a single photo of the cupcakes with the worst lighting possible. But I was proud of it. I was sharing my recipes as I wanted to not just on Facebook, but on a blog. Before I started blogging, blogs to me were something other professional people did. Not just random people looking to share recipes with their friends like I was trying to do at that point. So it felt like an accomplishment. That was after all what I started this blog for. To simply share dessert recipes with friends. So much has changed since then. It has become more than that. I still share recipes, but with way more people than I had originally imagined. That is awesome. 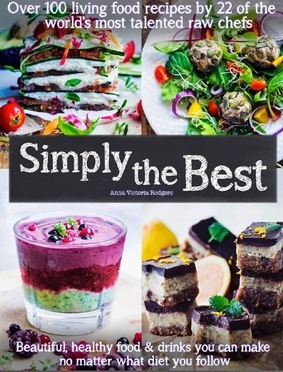 It makes me happy that so many of you want to read my recipes! I have changed my ways of eating as well. I went from vegetarian to vegan to mostly raw recipes and including savory items as well with the occasional body care recipe. I figure why limit myself to just desserts, and I know others might like to enjoy what I am having for dinner as well. I never thought I would have the audience I now have, and I am extremely grateful for each and every one of you who take the time to visit my blog and hear what I have to say or to find a recipe to try. Thank you so much for making my day by being here. 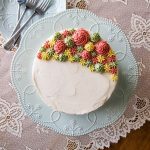 Since it is my blogaversary, I thought I would make a delicious cake to celebrate! 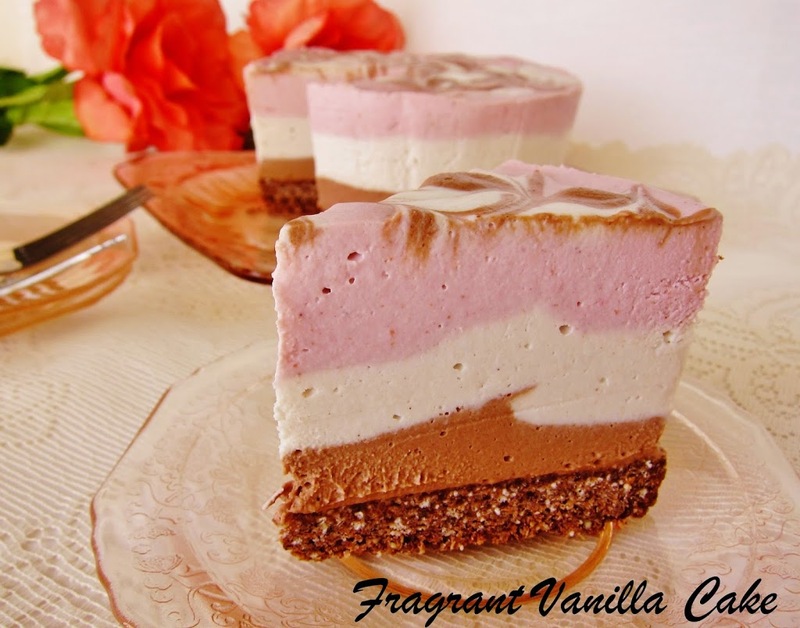 A Raw Neapolitan Cheesecake to be exact. 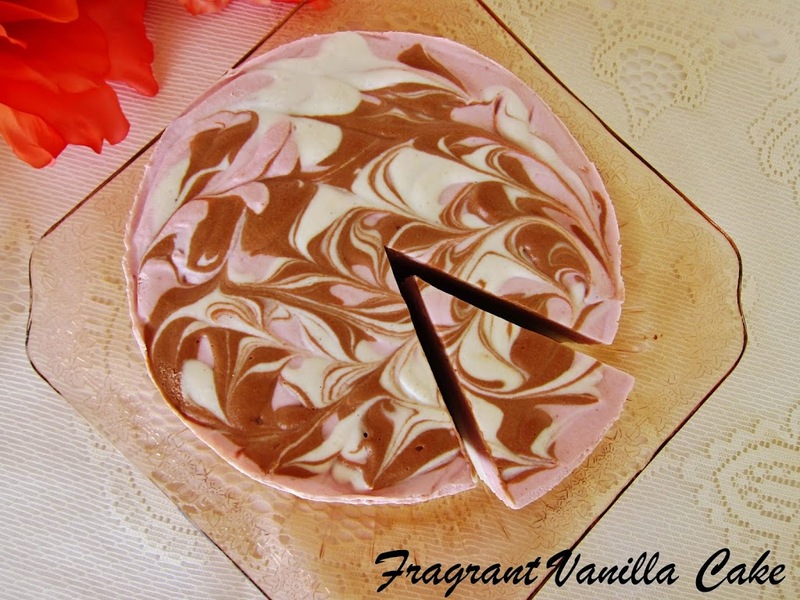 Neapolitan ice cream reminds me of birthday parties as a kid for some reason, so I thought a neapolitan cake for my blog's birthday would be appropriate. I made a simple raw cheesecake with fresh organic strawberries for one layer, raw cacao powder for the next and vanilla bean for the other and it was delicious! Simple to make as well, which I know you all appreciate. I think this might be a good recipe for Valentine's Day as well since anything with strawberries and chocolate is welcome on that holiday (at least for me). 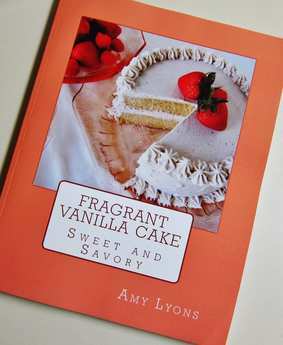 Lastly, besides the delicious cake, to celebrate I am giving away a copy of my latest book "Fragrant Vanilla Cake: Sweet and Savory" to one lucky winner! So scroll down to the bottom to enter! Good luck to you all and thank you for allowing me to keep my blog going with all of your support! Lightly coat a 6 inch spring form removable bottom pan with coconut oil. 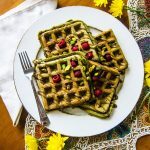 To prepare the crust, process flax, coconut, buckwheat and sea salt in a food processor until fine crumbs, then add the dates and process until the mixture holds together when squeezed between your fingers (if not holding together, add more dates). Firmly press crust into the bottom of the prepared pan, and set aside. To make the filling, in a high speed blender or food processor, combine coconut meat, water, coconut nectar, sea salt, vanilla and blend until smooth and creamy. With the processor running, add the coconut butter and process for a minute until blended. Divide the mixture into 3 bowls. Place one back into the blender and add the 1/2 cup strawberries. Blend until smooth, then pour back into the bowl. Rinse out the blender. Add the second bowl back to the food processor and add the cacao powder. Blend until smooth, and pour back into the bowl. To assemble the cake, pour the chocolate filling into the pan over the crust, reserving 2 Tbsp in the bowl and smooth out. Then pour the vanilla filling over that smoothing out and reserving 2 Tbsp in the bowl. Pour the strawberry filling over that, and smooth out. Then drop the reserved fillings over that randomly by the 1/2 tsp, and swirl with a knife then a toothpick for smaller swirls. Place in the freezer for about 4 hours to firm up. Store in the fridge. Just one?! OK, then it has to be the Kohlrabi Mushroom Corn Slaw with Creamy Hemp Dressing. I just ordered my young coconut meat and have dusted off my dehydrator. 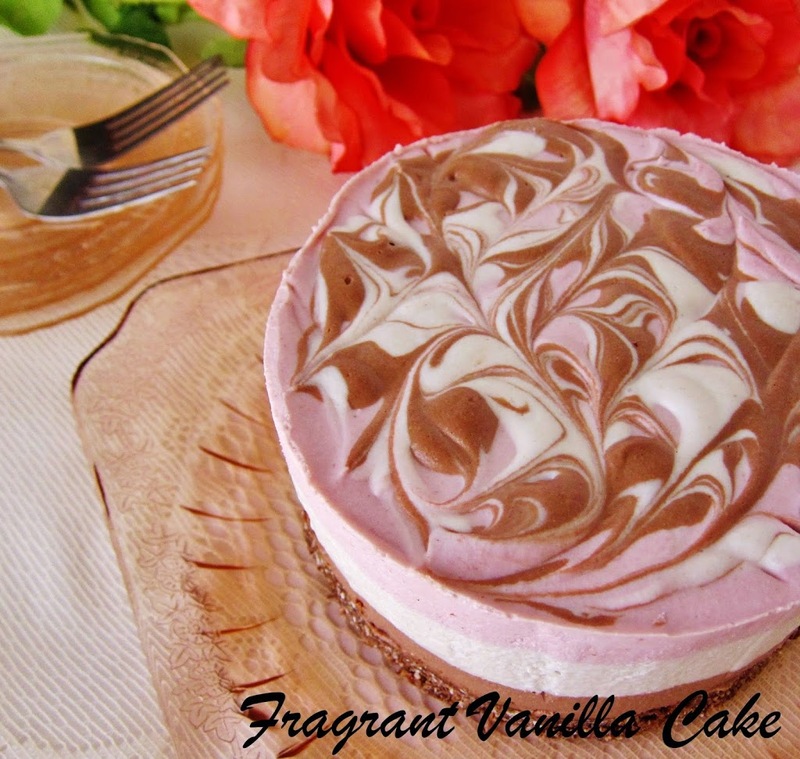 Time to play with more raw dessert recipes! LOVE YOU!! So hard to pick! But that 7 Layer Crave Cake looks AMAZING! Honestly, I haven't seen anyone do raw desserts better than you, so keep those coming! Congratulations on 4 years! I love all of your recipes and your pictures are just beautiful. 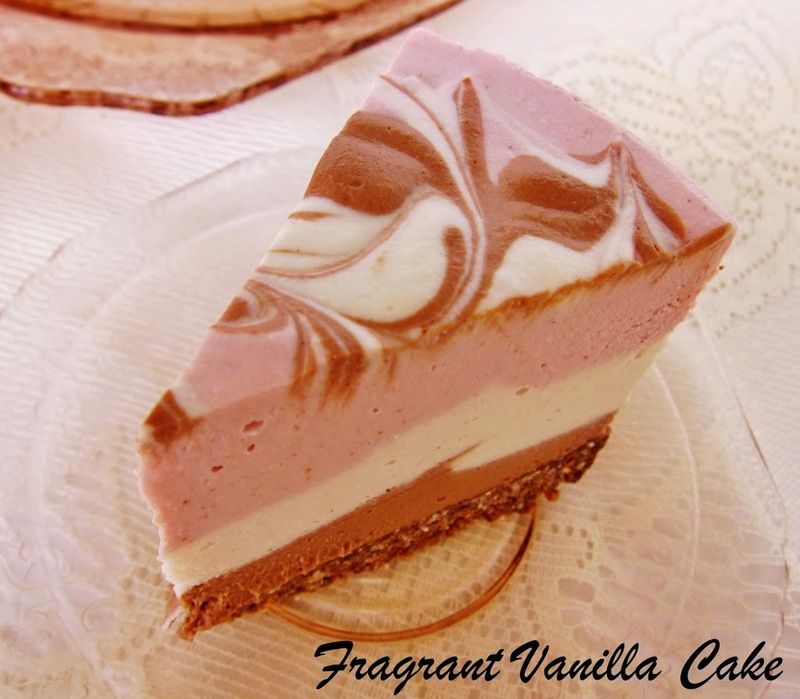 This neopolitan cake is GORGEOUS and I'm sure delicious! I really enjoyed all the recipes you had called "Raw Savory Thanksgiving Recipes" and then the desserts also. I have tested many many many of your recipes and the cheese cakes with black berries is what my family go nutty over. The parsnips (and I made the same recipe with carrots also) is always a winner to make with the dehydrated mushrooms -- big yummy and heads up on everything you publish -- it is easy to follow your recipes and they always come out 100 % -- a big thank you -- you are an INSPIRATION. My favorite is the samoa cheesecake! I love all your raw rice recipes! I had never even used celeriac before, let alone substituted it for rice! Can I just narrow it down to a category? Because the donuts have been awesome! Happy Anniversary & cheers to healthy vibrant eating! You have evolved and grown and share so much pure deliciousness with us all. I must say my favorite categories are your Cheesecakes and Dream-Cakes, but I cannot wait to try all of your dehydrated creations now that I have a dehydrator! Super excited. Congratulations again, here's to healthy eating! I'm sorry, I can't pick just one...Your desserts are gorgeous. I love the Raw Blood Orange Caramel Dark Chocolate. I love all your recipes, especially the cheesecakes! any recipes with lime !!! and more recipes with no coconut meat..it's very hard to get where I live .. Thanks for all you do to encourage people to enjoy healthy food! Oh my goodness, I have so many of your recipes bookmarked it's hard to pick one. I've got this one planned for hubby's b-day in a few weeks. This cake looks so amazing! I am thinking of trying this sometime soon! I recently found you blog and I'm looking forward to trying the raw tangerine coconut granola. I love your vegan chocolate banana chunk cupcakes. I like the easy Raw Sugar Cookie Dough Butter! I love peanut butter and chocolate so I will say Double Chocolate Peanut Butter Cups, although it is very hard to pick just one! I would love to see more coffee/chocolate combos and raw eclairs. Congratulations on 4 years of wonderful blog posts! I love all of your recipes, especially the ones that include peanut butter! I really liked your recent recipe for <br />peanut butter banana chocolate chunk cupcakes! And the raw red velvet strawberry filled donuts rock. I also love when you do DIY body products, like the great body frosting and lip balm! I'd love it if you made more DIY body stuff! <br />-Ellie<br />Keep up the amazingness though! You have mad frosting skills. i don't have a favorite, but they all look so good!! i am so glad that i found your page!! and so excited to share them as well and incorporate the recipes into my eating plan!! yay!! I love your layer cakes! I have to pick just ONE?! Okay, then it would have to be the Raw Samoa Cheesecake . . . samoas were my absolute favorite GS cookie before going vegan, and that cheesecake is a dream come true! I really like your savory recipes. I have loved trying the different kale chips you have created. You make beautiful food. I love the cheesecake recipes and banana ice cream recipes. The cookie dough is my favorite. <br /><br />You rock Amy!